A prolific and precocious springtime "fruit," rhubarb looks like stalks of pinkish green or even magenta celery. Its flavor is much more tart, making it ideal company for sugar in sweet dishes like crisps, compotes, and pies (from which it gets its second name, "pie plant"). Rhubarb also lends a puckery-tart fruitiness to savory dishes and pairs very nicely with pork and poultry. Rhubarb is usually sold without its leaves attached and for good reason: the leaves are poisonous. If you grow and harvest rhubarb yourself or buy it with the leaves attached, do not to eat or serve the leaves and keep them out of reach of children or pets. Rhubarb stalks are highly nutritious, containing loads of calcium, manganese, vitamin C, vitamin K, fiber, and a whole host of antioxidants. Hothouse rhubarb is available most of the year, while field-grown stalks are available in early spring. The Pacific Northwest is lucky enough to have a second harvest of rhubarb between June and July. The short growing season means you should enjoy it when you see it. There are two basic types of rhubarb found in markets and larger grocery stores: the older, traditional variety, with thicker, greener stalks, and the more intensely-colored, slender-stalked variety, sometimes called hothouse rhubarb. The deep red stalks certainly make for brighter, more attractive dishes, but the concentrated color indicates concentrated tartness and the greener stalks have a nicely balanced, mellow flavor. Whatever their color, the stalks should be heavy and crisp with taut, shiny skin. Watch out for rubbery, fibrous, and dry stalks. Wash the stalks well and trim off the dry ends and leaves, discarding them (remember, the leaves are poisonous). They contain oxalic acid, as well as anthraquinone glycoside. Store trimmed, cleaned, and dried stalks in loose plastic in the crisper drawer of the fridge. Rhubarb leaves contain both oxalic acid and a more potent, unidentified toxin, so trimming and discarding them is essential. While it's tempting to peel the fibrous skin as you chop the stalks, try to resist it. The skin holds lots of color and flavor. Two things happen to rhubarb when it's cooked: its juices thicken and it falls apart into fraying shreds of translucent fibers. Heavily cooked rhubarb has the perfect jellied consistency for jams, chutneys, and compotes. It isn't so attractive when stir-fried or arranged on a tart. Quick heat yields tender but cohesive rhubarb pieces with rich flavor and a natural, glossy sheen. Rhubarb's tart fruitiness makes it perfect to use in desserts. If you have a craving for rhubarb desserts, try rhubarb crisp, easy rhubarb cobbler, or strawberry rhubarb crumb cake. Rhubarb's intense tartness makes it a nice foil for savory dishes, too. If you're in the mood to try a savory meal, try marinated pork fillet roasted on rhubarb. 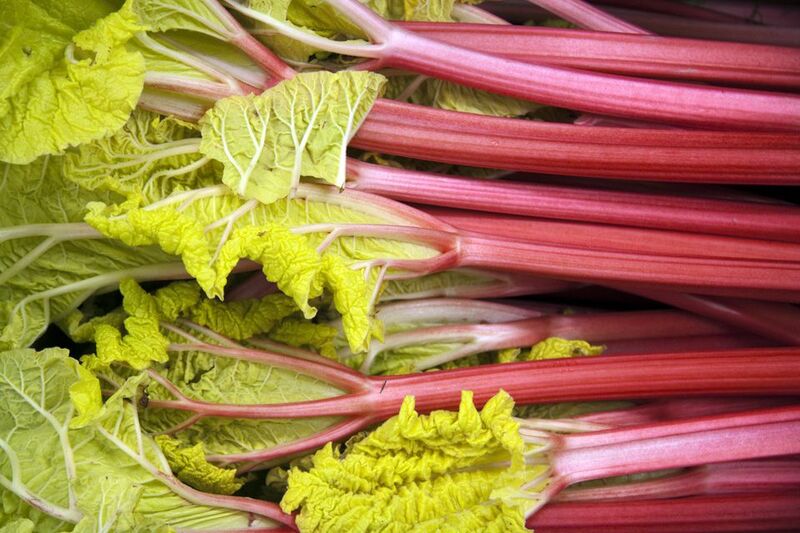 If you don't feel like cooking, try a simple snack and dip pieces of rhubarb in honey or sugar.